Sealaska Heritage Institute (SHI) will sponsor a lecture on the prominent Jilkáat Tlingit leader Kaalaxch next week in celebration of Native American Heritage Month. 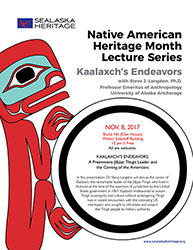 The lecture, Kaalaxch’s Endeavors: A Preeminent Jilkáat Tlingit Leader and the Coming of the Americans, will be given by Dr. Steve Langdon, professor emeritus at the University of Alaska Anchorage, Department of Anthropology. The free lecture is scheduled at noon on Wednesday, Nov. 8, at the Walter Soboleff Building in Juneau. Everyone is welcome.